with all the food set out. 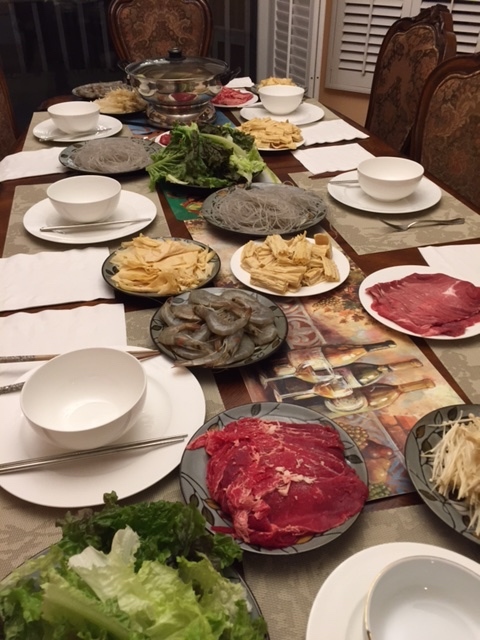 We were going to be treated to a hot pot meal. This is rather an Asian version of fondue, and our meal consisted of meat, seafood, vegetables, tofu, mushrooms, noodles and greens. All were gluten free. It is a very social method of eating, with people putting their food choices into the heated broth, and retrieving the morsels after they are cooked. Utensils included small strainers and chopsticks, with forks provided for those of us less practiced with chopsticks. The cooking pots are divided, so that the diners have the choice of using a more highly-seasoned broth on one side, or a milder flavor on the other. Dipping sauce was distributed to each person’s bowl. Our hostess took much of the responsibility for cooking the selected food for my husband and myself, as well as her children. 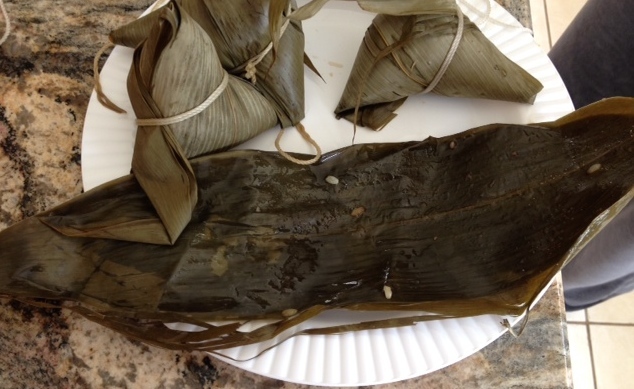 Reflecting on the experience, I am struck by how our neighbors have so successfully adopted many American traditions, and yet retained traditional Chinese customs and meals. They have done it all in a rather seamless integration. 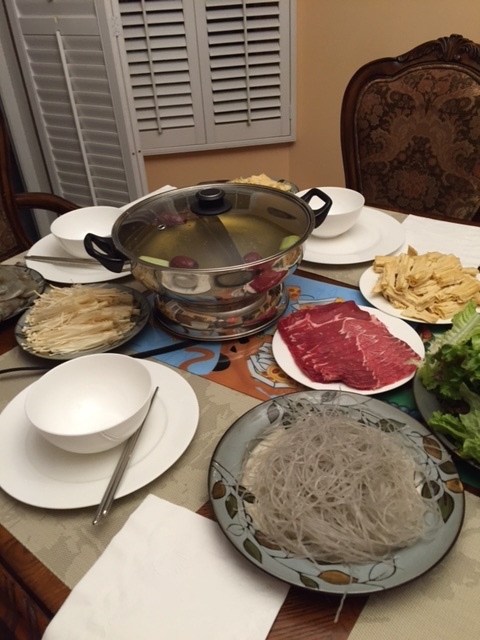 This entry was posted in Holiday meal, Traditional Chinese Food and tagged gluten free, Hot pot, traditional Chinese food on December 27, 2015 by goforsix. My introduction to Chinese food and customs is continuing. 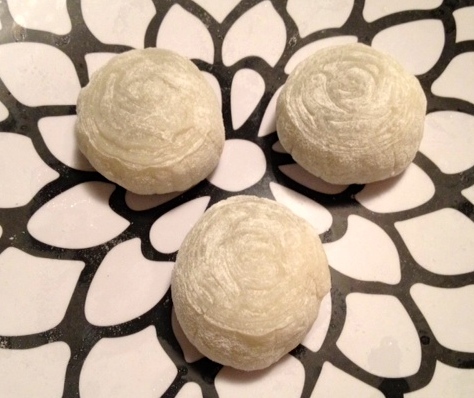 Last week, I was given a lovely gift of mooncakes, made with rice flour so that I could eat them. My neighbor explained that mooncakes are associated with a mid-autumn festival for moon worship and moon-watching. The mooncakes are gifted between friends and family as part of the celebration of this important festival. Checking the internet, I found that there are a variety of recipes. 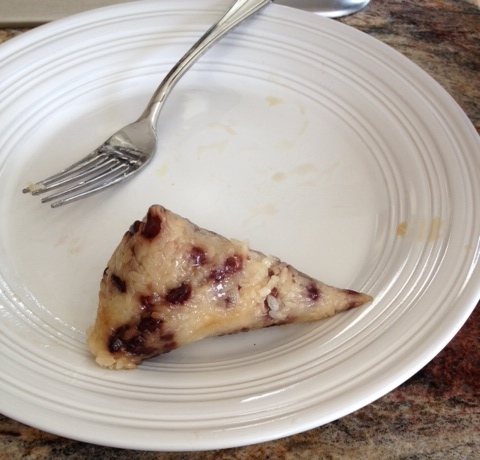 The cakes my neighbor prepared had a rather soft exterior with a sweet bean filling. The texture of the cake was unexpected. It was both soft and firm at the same time. The filling was sweeter than I would have expected for a bean-based filling. It almost seemed to have a slight blueberry flavor, although there were no berries used. As you can see from the photo, they were presented to me on a beautiful plastic plate. I have to find out where she found it. I treasure my friendship with my Chinese neighbors, and am so pleased to be introduced to the traditional culture. It has brought unexpected richness to my life. 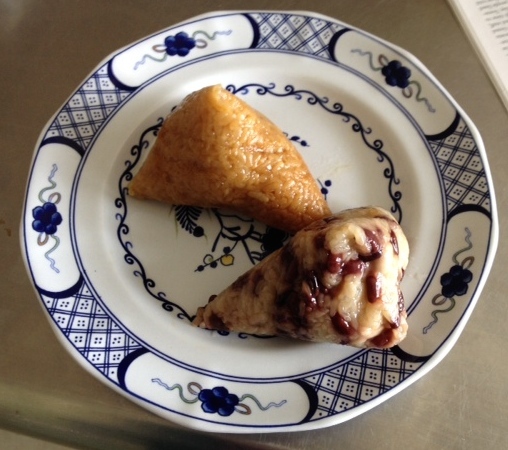 This week, a Chinese man came to the antique shop, and I was able to talk with him about mooncakes. He was pleased to have me bring up the subject, and added his own comments about the festival. This entry was posted in Traditional Chinese Food and tagged Chinese food, Chinese traditional food, mid-autumn festival, mooncakes on September 10, 2014 by goforsix.